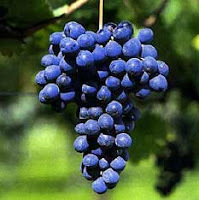 Other Names: Barber a Raspo Rosso, Barbera a Peduncolo Rosso, Barbera a Peduncolo Verde, Barbera a Raspo Verde, Barbera Amaro, Barbera Crna, Barbera D'Asti, Barbera Dolce, Barbera Fina, Barbera Forte, Barbera Grossa, Barbera Mercantile, Barbera Nera, Barbera Nostrana, Barbera Riccia, Barbera Rissa, Barbera Rosa, Barbera Vera, Barberone, Besgano, Cosses Barbusen, Gaietto, Lombardesca, Ughetta. Barbera is an indigenous Italian grape variety that is often consumed regularly by the patrons of the cities where it is produced. It is second only to Sangiovese in terms of plantings in Italy. It generally imparts good yields and provides a deep colored, and in some cases low tannin wine with good acidity. Barbera wines are generally less sofisticated animals, but can and are becoming more intense and extracted as the focus on quality and demand increases for the category. In Piedmont the earlier-ripening Barbera is grown on the cooler lower slopes below the Nebbiolo and other secondary locations. This explains why in the DOCG in Alba (Barbera d'Alba) very little Barbera is planted, because Nebbiolo grows in similar locations and demands a higher price for it's wines. Attempts have also been made by many California and other New World wine producers to craft wines from this variety, many of which are noble attempts.